Had several quotes to fix an annoying leak in our foundation that happens during heavy downpours of 20+ MM of rainfall. Called several companies of which only 4 actually came out an gave me a quote. Vlad came at the appointment time and used his moisture meter and was one of the only people to move furniture and items around to try and find a leak from the inside or detect where water was pooling. My basement is mostly finished so the leak was suspected to be behind one of the finished walls based on what the moisture meter was indicating and how the water was travelling. Vlad explained what he suspected was happening and gave me several options and two quotes based on different lengths of repairs. We decided exterior waterproofing was the best solution and signed to go ahead. Initial dig was delayed because of Onemark/Promark being greatly delayed in marking the utilities but as soon as that was done they came on the Friday and finished the job late Saturday. They did a great job of protecting the area and left it completely clean as if they had never dug before. Would highly recommend Vlad and Bodhana from Umbrella Waterproofers for any jobs. Thank you for the review Gianni and your business. AMAZING company! I hired Umbrella to waterproof after discovering water in the basement in my newly purchased home. As a single mom who just purchased a new house, I was a bit overwhelmed with the work that had to be done. Vlad and Bohdana always put my mind to ease and were so awesome to work with - both were extremely knowledgeable and communicative. They made everything easy and seamless. They even organized two teams to complete the job in a condensed amount of time. 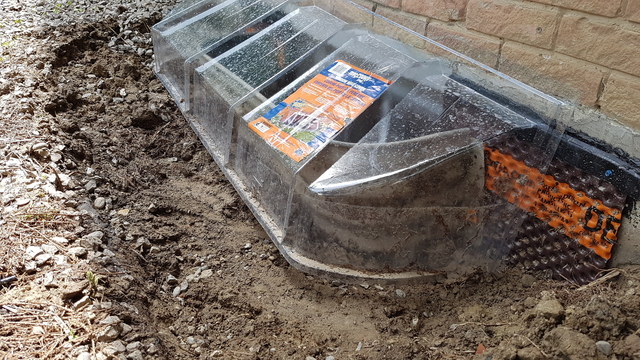 When asked about the sump pump, Vlad said he would see if it was required after looking at the current state of the existing system. He concluded that he didn't think it was necessary. Other companies I got quotes from tried to up-sell the sump pump. I decided to get that and the backwater valve put in because of the city rebates. I really appreciate the integrity and ethics of this company. Vladimar, the plumber who did the sump pump and backwater valve install (and toilet repair) was respectful of my space, ensuring minimal mess and was super efficient. I have already recommended them to my neighbour, who is also using them, as well to many others looking to waterproof. Thanks again Umbrella team! You rock!! We had water leaking from the basement ceiling and I called these guys for help. By the time technician Vald came to our place, the restoration company had already been here and opened up the ceiling to expose the pipes. We turned water on and off from various locations and eventually found out that it's a sewage backup causing a leak from the ground floor toilet. Unfortunately the technician did not have the equipment to deal with such a scenario so he called the office and arranged another technician to come in the afternoon, but had to charge me an inspection fee. The other technician came with an inspection camera and a heavy duty snake to open up the clog in the sewer, while keeping me informed the whole time, and made followup suggestions regarding the situation of the sewer pipe. He also answered all my questions thoroughly. I'm generally very satisfied by the technician's courtesy, but the inspection fee was quite steep, not to mention they had to arrange another technician here with another bill on using the equipment. Vlad and his team are great. I highly recommend using him for any waterproofing, drain and plumbing jobs. He is prompt, their team work hard to finish quickly while getting the job done right the first time. As best as he can, he will warn you of any surprises that may arise along the way, which is appreciated. This is the second time I've used Vlad and his team to do a job, and he guarantees the work that he does. The first time was for a waterproofing problem along the back wall of my house. 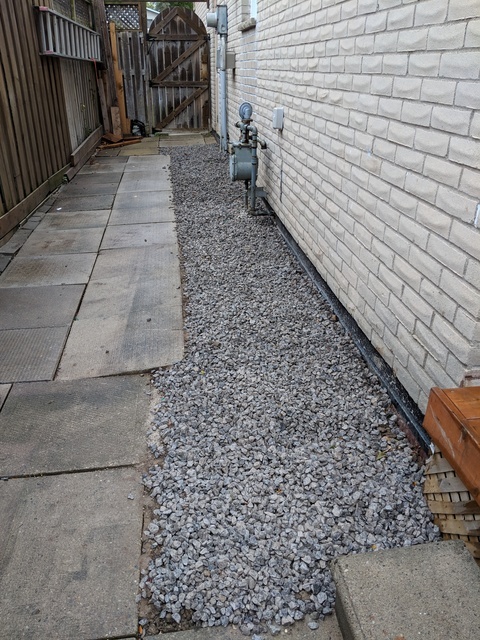 The second most recent job was to install a backwater valve and fix a drainage problem along the other side of my house. All of these jobs was done very professionally without an issue. They arrange for all permits, city inspectors etc. I highly recommend using them, I wouldn't go elsewhere. Had a couple of quotes to waterproof my basement which was damp but not actually wet. I was really satisfied with how detailed of an analysis and quote I received from Vlad so I went with them. I had a good experience from start to finish. Communication, work quality and cleanup were all excellent. 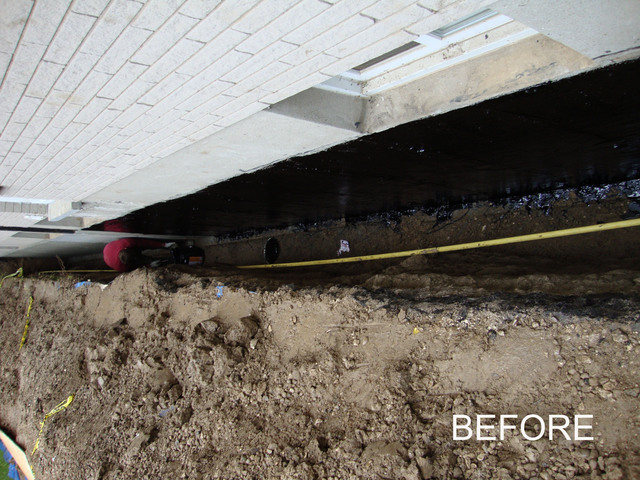 The crew worked extremely hard without complaint (They found my basement floors were over a foot thick and very difficult to break)! Bohdana from the office made everything very clear and reached out to me whenever I needed to be aware of a fact. Vlad was always available for questions (of which I had many!). Overall I was really pleased and would for sure recommend to others. basement stack was clogged right below the clean out. All greese! 11yr old home in markham (just bought house last year). I rented and snaked the pipe for over 2hrs with no luck. Then we called another plumber and they also tried snaking for another 2hrs. They seemed to get further but was not draining and they recommended hydro jetting. After calling multiple plumbers with reputable ratings on homestars I ended up choosing Umbrella who's rates where more than half of the price of everyone else's quotes! Bodanna is very professional and knowledgeable as she knew right away what the issue was. She walked me through the procedure and what to expect from the plumber (Vlad). When Vlad arrived he was on time, very careful and clean walking us through everything he was doing. He even used the camera to show us what was being found and how it was progressing at no extra charge! All of the other companies where charging additional $300 to just use the camera! End of the day our problem is solved and we can now use our sink and dishwasher. I will definitely be using them in the future if need be. Thanks Bodanna and Vlad! Thank you for your business. Your review is very much appreciated! It was our pleasure dealing with you too and thank you again for choosing us. Your trust and sharing your feedback are immensely important for us. Feel free to contact us any time whether you have a question or need professional help - we'll be always happy to help. P.S. We are not addressing you by your name only because you registered as a private user hence we'll honor that, but we remember you. I had a ton of water under my newly built deck that would not drain. I was referred to Umbrela and it was a great experience. Bohdana was extremely accommodating with my work schedule to set up a meeting with Vlad and kept me updated. 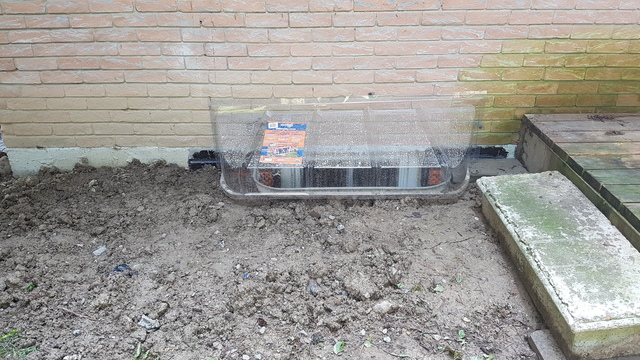 Vlad was very knowledgable and had a great detailed plan on how to drain the water via a French drain system. 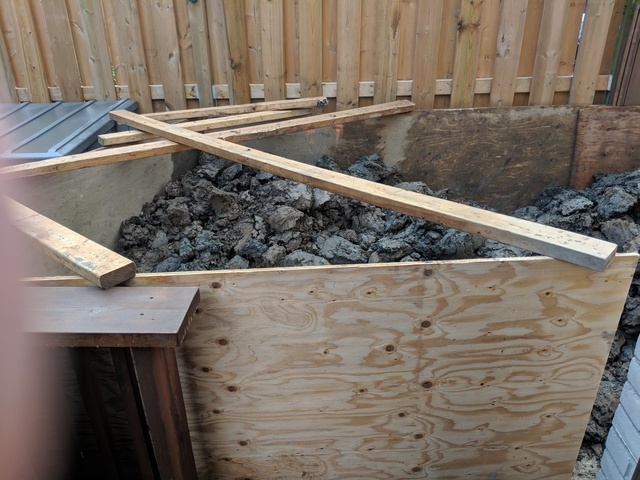 The workers showed up on scheduled time, completed the drainage system in two days and cleaned up to the point where it looked like nothing happened. I will definetly use Umbrella again and will refer to friends and family. Our basement flooded from the window wells during the flash flood. Vlad was very knowledgeable. He checked inside the basement for cracks and moisture level, (there were none); explained the possibilities and areas of concern and gave me a reasonable itemized quote. 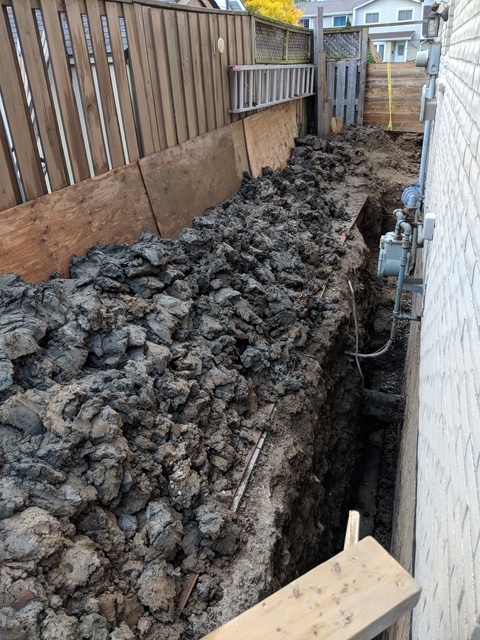 A guy from another high-rated homestars company came and gave a quote for $8000 saying they would have to excavate the whole side of the house without even taking a look at the condition of the foundation... so glad I didn't go with them! So grateful that they could fit us in quickly despite their busy schedule. The work was done by two men over a period of 3 days. They dug out the trench, made sure the weeping tiles were working efficiently by sending a camera down them, one of the weeping tiles was completely blocked. They put in a new one at no extra charge which I was so grateful for. They waterproofed the area putting, I believe, 3 different layers of protection. 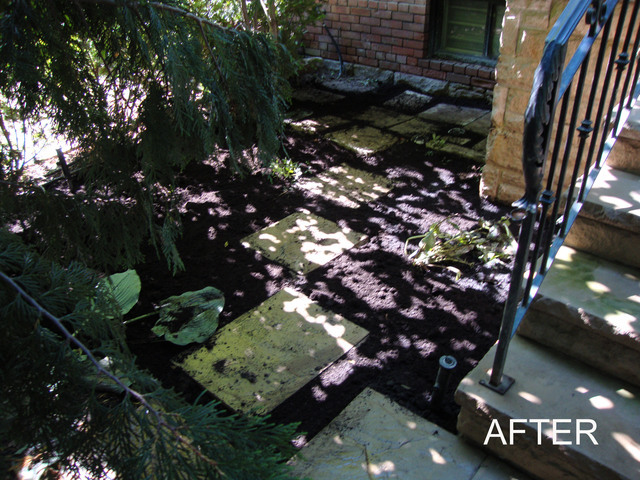 They completed the work leaving the place looking neat and tidy. All throughout they worked very hard and efficiently. I thoroughly recommend this company for your waterproofing needs. Thank you for sharing your experience. Your review is very valuable to us as well as for the homeowners like yourself. Thank you for choosing us. We are reputable plumbing and waterproofing company that offers top services and affordable prices that help you save money and guarantee quality results. We guarantee you Peace of Mind. We are family based business that works on independent basis therefore we are able to compete in prices and offer our customers non-beatable quotes. No high prices, no aggressive sales, no commission based contractors, and no pressure – it is our policy. 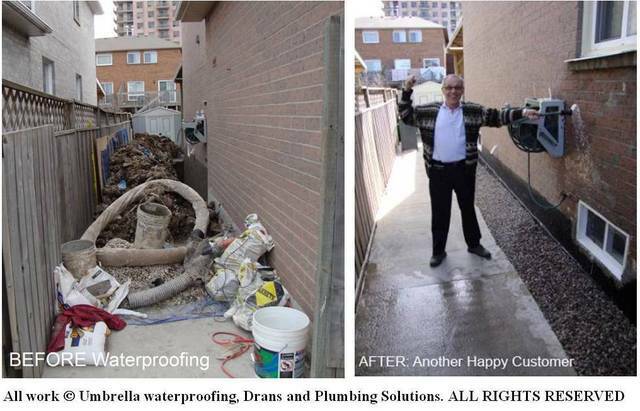 Our company is an expert in all areas of plumbing (residential, high-end commercial & industrial), waterproofing (exterior & interior waterproofing), all foundation repairs, drain repairs, underpinning and basement lowering. 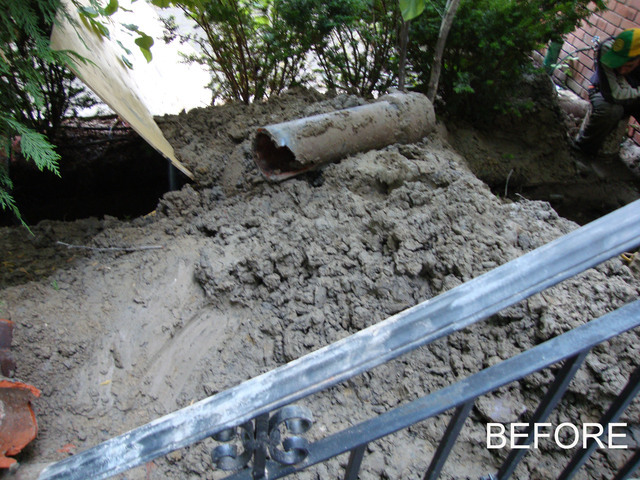 Our wide range of services includes thorough diagnostics, camera inspections & no dig technologies – air lining pipe bursting, which save your landscape and provide clean results. We run our business with integrity and treat our customers with respect. We GUARANTEE YOU PEACE OF MIND at a fraction of the cost. We are the EXCLUSIVE carrier and the ONLY distributor of the top of the line newest technology moisture meters (designed and manufactured in Europe) - deep probing, non destructive and accurate; which we use to detect and to measure the amount of moisture in concrete and other building materials. When you are purchasing a house or you are concerned about dampness and moisture in the walls (especially basement), contact us to inspect the walls with one of our meters! 100% Accurate! No faulty results! This will save your money! Umbrella Waterproofing, Plumbing & Drains offers: All plumbing repairs and installations; Exterior Waterproofing; Interior Waterproofing; Full Drain Services; Underpinning; Basement floor lowering; Concrete floor installation; Emergency Services: drain cleaning, building drain replacement, water pipe burst repairs, video inspection of drains & snake cleaning; High Pressure Water Jetting; Sum pump installation; Back flow prevention; Backwater valve installation; Sewer Ejector installation; Trench-less Technology; Weeping tile systems; 4 layer waterproofing technology; Underground waterline upgrade; No digging technologies (air lining pipe bursting) - save your landscape! 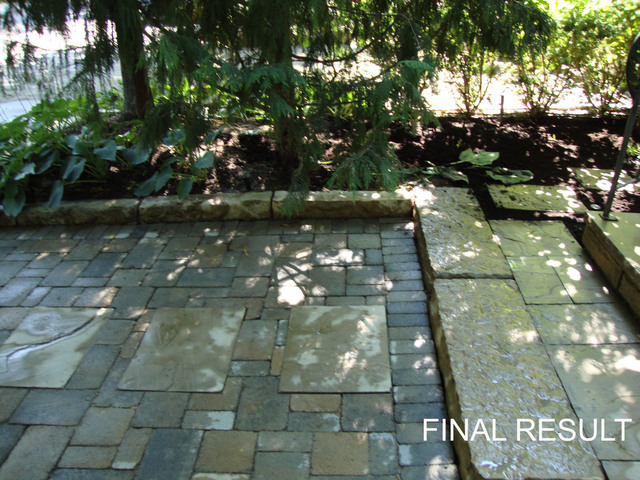 We provide you with free estimates and prices upfront before we start.